Create the most comfortable place to sit in your home with heat and massage. Ease aches and pains, increase blood flow and eliminate stress with the heat and gentle touch of this recliner. Back massage helps increase blood flow and allows endorphins to be released in your body creating a happier and healthier life style. This upgrade can help athletes, those with chronic pain or those who just want a place to comfortably relax in their home. With rocker recliners, you can change the length of your rock and recline pitch, or angle, to coordinate with your size and height. Three height settings are available to choose from, and you can easily make this switch to your recline mechanism any time. This breathtakingly- spacious recliner extends to the length of a king-size mattress when its fully extended, so it can easily easily accommodate people of all shapes and sizes. Lay back and relax on these pillow-soft bustle back and pad-over-chaise cushions, providing your entire body with the pleasing feel and resilient support you desire. 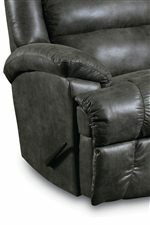 The Comfort King® recline mechanism allows this chair to support up to 500 pounds of weight. 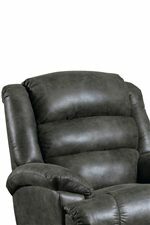 The Knox ComfortKing® Big and Tall Rocker Recliner by Lane at AHFA in the area. Product availability may vary. Contact us for the most current availability on this product. Arm Plush pillow arm. Reinforced arms with steel frame supports. Recliner Mechanism Durable tempered 7 gauge steel mechanisms are precision engineered & balanced for maximum comfort and ease of operation, featuring shoulder riveting in major wear points, lubricated pivot joints, Delrin spacers, and an oven-baked finish. Hands-free ottoman closure. Frame Construction Frames feature engineered hardwoods, and mortise and tenon joint construction for stronger joints. All hardwood components are made from kiln-dried lumber, double-doweled, glued, corner-blocked, and incorporate 7-gauge steel action brace construction. The pitch and size of each piece is engineered for generous comfort. Frames are built with 20% more wood for extra durability. Fully unitized high carbon steel seat frame. Padding & Ergonomics At the core of each cushion is high-density, high-resiliency foam, which is wrapped with thick layers of polyester fiber to ensure comfort and durability. 2.2 high resiliency foam seat cushions. Seat Support 8-gauge sinuous steel springs attached to a sturdy hardwood/plywood frame with special lined clips for noise-free, lifetime easy seating. Welded steel coil base spring system. A good piece of furniture can easily become a comfortable fixture in your home and in your life, but it has to be able to stand up to the trials of daily use. That's where the Knox collection fulfills all expectations. These incredibly spacious recliners and reclining loveseats were constructed from durable, kiln-dried lumber, wrapped high-density foam, and heavy-duty 7 gauge steel recline mechanisms, so they can easily support up to 500 pounds of weight. These recliners will wow you with their sheer size and scale, as chaise leg rests extend to the length of a king-size bed. Exceptional in quality, casual in design, a Knox recliner is an excellent choice for your home. The Knox collection is a great option if you are looking for Casual furniture in the area. Browse other items in the Knox collection from AHFA in the area.